Ko pplung von Dy namik und A tmosphärischer C hemie in der S tratosphäre Investigation of mutual influences of greenhouse effect and changes of dynamic. 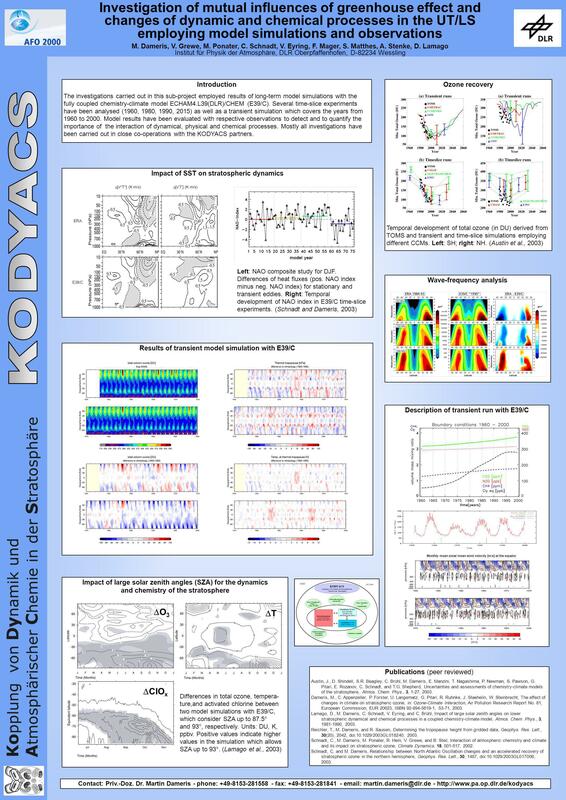 Download ppt "Ko pplung von Dy namik und A tmosphärischer C hemie in der S tratosphäre Investigation of mutual influences of greenhouse effect and changes of dynamic." Simulated Stratospheric Temperature Trends SPARC Temperature Trends Meeting: April 13, 2007 Washington DC. Modes of Annular Variability in the Atmosphere and Eddy-Zonal Flow Interactions Sarah Sparrow 1,2, Mike Blackburn 2 and Joanna Haigh 1 1. Imperial College. Norwegian Institute for Air Research The Tropopause at High Northern Latitudes: Trends and Influence of Atmospheric Dynamics Georg Hansen and. 3 Reasons for the biennial tendency: The biennial tendency in HadCM3 2xCO 2 is in contrast with observed basinwide El Niño events which are often of 4-5. Institut für Physik der Atmosphäre Ensemble Climate-Chemistry simulations for the past 40 years Volker Grewe and the DLR/MPI Team Institut für Physik der. Simulating the atmospheric composition during the last decades: Evaluation with long-term observational datasets and the impact of natural climate variability. Henk Eskes, William Lahoz, ESTEC, 20 Jan 2004 The role of data assimilation in atmospheric composition monitoring and forecasting Henk Eskes, William Lahoz. Annular Modes of Extra- tropical Circulation Judith Perlwitz CIRES-CDC, University of Colorado. The other Harvard 3-D model: CACTUS Chemistry, Aerosols, Climate: Tropospheric Unified Simulation Objective: to improve understanding of the interaction. How does the QBO affect the stratospheric polar vortex? Peter Watson, Lesley Gray Atmospheric, Oceanic and Planetary Physics, Oxford University Peter Watson. 1. A Chemical Characterization of North American Pollution Plumes over Europe 2. A 15-Year Climatology of Global Warm Conveyor Belt (WCB) Transport A. Scientific Advisory Committee Meeting, November 25-26, 2002 Modeling of the Middle and Upper Atmosphere M. A. Giorgetta E. Manzini 1, M. Charron 2, H.
Spring Onset in the Northern Hemisphere: A Role for the Stratosphere? Robert X. Black Brent A. McDaniel School of Earth and Atmospheric Sciences Georgia. The Potential for Skill across the range of the Seamless-Weather Climate Prediction Problem Brian Hoskins Grantham Institute for Climate Change, Imperial. By studying the case with QBO signal only, the model reproduces the previous observation that QBO signal of column ozone at equator is anti-correlated. Long-Term Evolution of the Tropical Cold Point Tropopause Simulation Results and Attribution Analysis Thomas Reichler, U. of Utah, Salt Lake City, USA. National Oceanic and Atmospheric Administration Geophysical Fluid Dynamics Laboratory Princeton, NJ 08542 Evolution of Stratospheric.